Womens vintage footwear never gets boring as the eras are every bit as fascinating as the one that went before it. 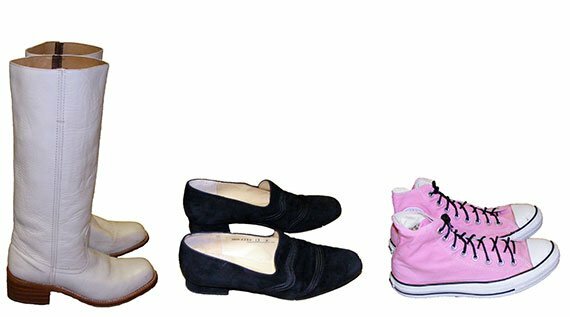 For a vast and versatile range of footwear from every decade, take a long and relaxed look at our range of vintage womens footwear . I think you’ll be pleased at what you see before you, because our extensive range of shoes is pretty special and covers a broad area of styles and trends over the years. Whether it’s a forties Cuban heel you seek, or a chunky court shoe from the fifties, we’re bound to have it and in a range of different sizes. We always make sure our stock is checked for quality and condition, so you know you’re getting an investment when you buy from us, with a pair of shoes that can be worn again and again. And it’s true to say that they really don’t make shoes like they used to and the craftsmanship you see on some of them you won’t see on today’s high street. Whether it’s a pair of good quality DMs you’re looking for or a pair of 70s sneakers, you’re bound to find them in our shop. We have stocky 20s heels and sweet Charleston Mary Janes, smart brogues too, for both men and women. A good pair of shoes will always compliment any outfit if chosen well. If you’re wearing vintage and you want to achieve a thoroughly authentic look, then we can help. However, you may be choosing a vintage pair of shoes to finish off a totally modern look and that’s good too, because we can help with that as well. Just come on down to Blue17 and have a look at our stock, online or in store. With our fantastic womens vintage footwear section, we’ve got what you need.